OUT now Hysteria ´s Album- Mass Mind Control Manual! Get your and support both label and Artist! Music is an uncanny force of nature – born from sounds created by oscillating particles that through their vibrations transmit energy. It is often said that the greatest of things have the most humble of beginnings, and the creation of music encompasses this idea perfectly. But music is more than just a force of nature, it has a way to transcend the physical and enter the spiritual where its influence cannot be quantified not contained even by the boundaries of time. It was one awesome and all-consuming experience with music that lead William Langroudi to dedicate his being to studying the science and magic of music. As he studied and learned more, music began to permeate into his very being and slowly but surely – the ‘Hysteria’ alter ego was born. As the sonic experiments grew in scale and complexity, so did the musical energy within him to the very brink of what his physical body could hold– and so Hysteria created the ‘Mass Mind Control Manual’. With the help of the legendary Spectral Records, Hysteria’s dream is finally being realized after being conceptualized, developed, and thoroughly tested on dance floors over the course of 2 years, where he tweaked, reworked and fine-tuned this epic sage of melody, groove and sonic energy! This album contains 7 Hysteria solo tracks, rumored to be fragments of his music induced consciousness that broke away from the fabric of his being – along with a retelling of sonic mistress Iliuchina’s “You Drive Me Crazy” and a meeting of two titanic minds – a jaw dropping collaboration of Hysteria and Tryambaka! 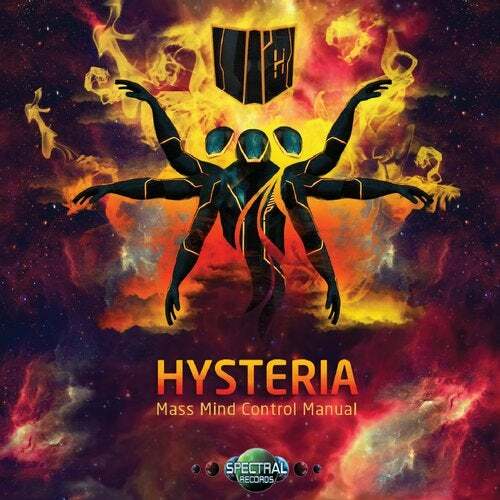 With this album, Hysteria’s “Mass Mind Control Manual” is finally unleashed and the music within is free at last to infect minds, bodies and dance floors continuing the ancient journey to transcend physical reality!